D M Flooring - Carpets/Flooring based in Uckfield, East Sussex. 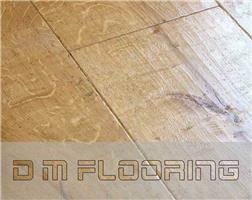 D M Flooring is a small reputable company based in the area of East Sussex. We have been trading over 15 years and have a vast amount of experience, knowledge and expertise in the flooring world. We take on all aspects of flooring from sub floor leveling and repair work to supplying, fitting and finishing the product. No job too big or small. A fast and reliable service. Please visit our website for more information. We now specialize in the supply and installation of internal wall cladding.